When thinking about work and work environment, happiness ranks low on most people’s list of workplace benefits. Your level of happiness at your workplace has a great impact on your productivity, how you plan ahead and your life in general, which is why you must implement strategies for increasing happiness a work. 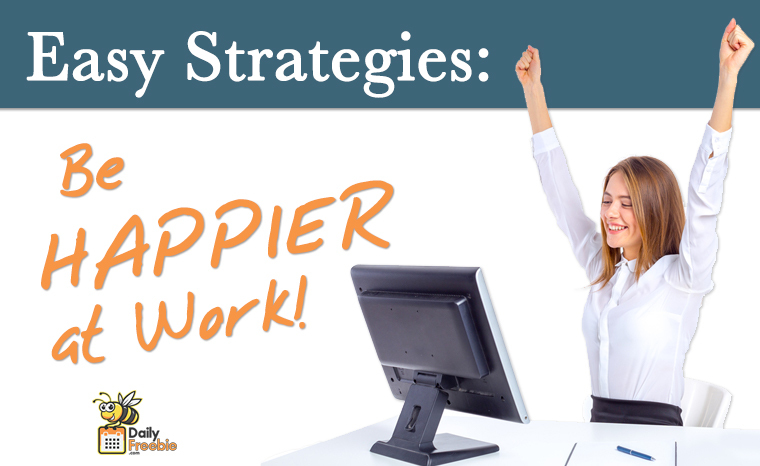 To help you get started we have listed a few simple strategies that can help you get started on your quest to be a happier version of yourself at work. Find a Meaning – It’s easy to say “do what you love”, as it comes attached to a long list of bills and due dates that will weight you down. However, there does come a point in life when you have to stop running after money, and really ask yourself does your job make you happy? Is it really what you want to be doing for the rest of your life? In other words, look for a meaning, the reason why you are in the position you hold today. If the meaning is loud and clear, then it should be enough to make you happy. Office Nest – You spend so much time at your office, that it is impossible to get by without creating an office nest. This way you won’t find yourself counting the minutes until you get home, because you will be perfectly comfortable in your space. Start by customizing your cubical or office, and add a touch of your personality to the mix. Making sure you are as comfortable as you will be at home. Work Best Friend – It’s impossible to get through the highs and lows of work without having someone who understands what you are going through. Which is why you need a work best friend that is constantly there to support you through your nervous breakdowns, self-doubting moments and everything that comes with it. Smile Openly – Try to smile more when you are talking to your coworkers, or when you pass them by. Smiling more can have a wonderful impact on your body and mind, as it notifies your brain that you are happy and content with your life. This automatically releases neuropeptides that offer you a sense of being loved. Future Oriented – The only way to ensure happiness is work is to know where you are going. There must be a reason why you get up early every morning and prepare for the same day. Which is why we urge you to set a goal and decide where you wish to be in a few years. This way you will know what you are working towards, and it can help you stay focused and happy. Leave Personal Problems – Everyone can compartmentalize to some degree or another. This comes in very handy at the workplace. To be productive, one should have a clear head free from outside distractions such as family or personal problems. That’s why it’s important to keep your personal problems at home and your work problems at work, dealing with them in their respected time frame, making sure one does not take over the other. This will not only lead to more happiness at work but at home as well! Happiness at work is extremely important to job performance and your overall well-being. Hopefully implementing a few of these strategies will help decrease stress and increase your level of happiness at work.